NEC Energy Solutions (NEC ES) has announced that it is supplying the Neoenergia Group with NEC’s DSS® distributed storage solution. Once completed in August of 2018, the lithium-ion technology based system, along with NEC’s proprietary software and energy storage control system AEROS®, will be used in an R&D project to assist in demand charge management and firming of the island’s solar power generation. 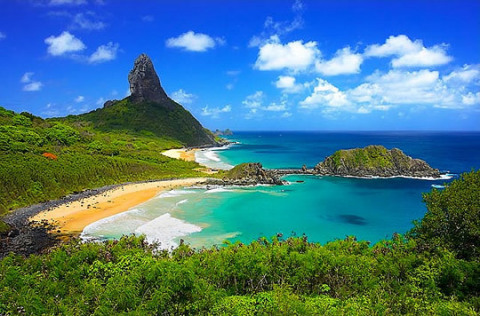 It will also assist in diesel fuel reduction to help preserve the natural environment of Fernando de Noronha. The proposal was presented by Celpe, of the Neoenergia Group, in response to a request from ANEEL (National Electric Energy Agency) in 2017. The installation of the energy storage system, under the project management of the Lactec Institutes and partners – IATI, UFMG, USP and TECSYS – has already begun and aims to find efficient and effective solutions for the storage and management of the energy generated throughout the day from two solar systems. The project also aims to find a sustainable and ecological way to replace energy generated by diesel, currently used in the archipelago at times when there is no sun. To date, there is no energy storage system in Fernando de Noronha that allows for the accumulation of energy generated throughout the day. According to Carlos Eduardo Ribas, commercial manager of the Lactec Institutes who will act as project manager, NEC was not only chosen for the product attributes of its DSS® solution but because of the company’s consultative approach in all aspects of the process which ultimately led to the identification of the best solution, specifically relevant to the unique needs of Fernando de Noronha. Additionally, NEC’s DSS® distributed storage solution works in small-sized enclosures – adding more safety, without affecting its energy characteristics, which proved to be one of the most efficient products on the market. Because of this it fully met the needs of the Fernando de Noronha archipelago project. The DSS® platform is scalable from 85kWh to 510kWh of energy storage capacity and offers from 100kW up to 710kW of power capability. As a standardized, UL safety-certified, AC-ready system including power conversion system, the DSS® product is preconfigured in outdoor-rated enclosures, compliant with all relevant regulatory and environmental requirements and is backed by up to a 10 year product warranty. NEC Corporation is a leader in the integration of IT and network technologies that benefit businesses and people around the world. The NEC Group globally provides “Solutions for Society” that promote the security, safety, efficiency and fairness of society. Under the company’s corporate message of “Orchestrating a brighter world,” NEC aims to help solve a wide range of challenging issues and to create new social value for the changing world of tomorrow. For more information, visit NEC at http://www.nec.com.